Great beds, no bull is a simple way of saying that we, at The Original Mattress Factory, live by a code. At the heart of our homespun brand is a high ethical standard. Our founder, Ron Trzcinski, left his role as President and COO of one of the nation’s largest mattress manufacturing companies three decades ago to create a mattress company that respected its customers. Since then, he has honestly served the hard working men and women who deserve comfort and need relief from the dishonest practices of an industry that embraces deceptive practices. Looking for an honest price on a locally hand built mattress? No reason to wait for a holiday to shop - today works for us too. It suddenly seems like there is a mattress store on every corner! How can this be? Well, just google mattress mark-ups and you’ll find out. Unlike our competitors, we keep costs low by manufacturing our own products in our own local factories. This not only means that we sell you high quality at a great value, but that we understand how our mattresses are made and more importantly, why they are made that way. Most other manufacturers rely on outside mattress retailers to sell their products. This extra step adds both complexity and high retail mark-ups that significantly increase the price of their products. Manufacturers also tend to make minor modifications to their mattresses for each individual retailer. These modifications make it impossible for you to shop different stores and compare models to make sure that you’re getting the most for your money. Unlike a wooden platform or foundation, a real box spring provides support and acts as a shock absorber for your mattress. A box spring is actually designed to work together with the mattress and can help to extend the life and comfort of your set. This differs from a foundation or semi-flex foundation, which is rigid and is really only useful in adding height to your sleep set. So don’t try to save money by not replacing your box spring when purchasing a new mattress. The more wood and wire, the better, so ask for heavy gauge wire modules and solidly built wooden frames for the best long term support and durability. Spend your holidays at home. The Original Mattress Factory has never had a sale. In an industry where sales appear to be the norm, you might ask yourself, Why? It is because we are a factory direct operation and already offer our lowest price to every customer, every day. In addition, we believe that everyone should get the same fair price, regardless of when they come into the store. Sales tend to create false pressure to buy, but we believe that it is important to take your time and select the mattress that is right for you at the time that is right for you. Besides, the so-called sales that you see at other stores aren't really sales at all. They are just promotions created by advertising low-end prices or phony price cuts to meet the consumer's desire for a deal. After all, if a store can afford to sell for less on certain weekends or holidays, why not all the time? So spend your holidays at home, not in a mattress store. So why only use one? 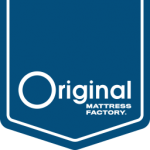 Unlike most manufacturers, The Original Mattress factory still makes two-sided mattresses. Every Original Orthopedic mattress has two sides and therefore offers more value as it will wear better and stay comfortable for longer than a one-sided mattress. Similar to rotating the tires on your car to extend the life of the tire, rotating and flipping your mattress will extend the comfortable life of your mattress by sharing the wear over two sides. While one-sided mattresses are marketed as convenient no-flips, they are really "can’t flips" that have only one sleep surface and therefore a shorter comfort life. It doesn't make the mattress softer. Puffery is a common technique used in advertising and selling. It occurs when a sales person or advertiser exaggerates the benefits of a certain product just to close a sale. Since anyone can say their product is better than someone else's, puffery is just one more reason why you need to shop smart. 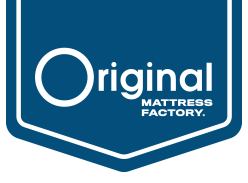 If you come to The Original Mattress Factory first, we promise to spend the time to answer your questions and help you learn what makes one mattress or box spring different from another. Only then will you be prepared to make the best purchase decision, regardless of where you decide to buy. Mattress manufacturers are continually adding features such as cooling gel, foam encasement, thin layers of memory foam, and wool, silk or cashmere fibers to their mattresses. These features increase the price of the product, sometimes by a substantial amount, but do they actually provide any real benefits that make them worth the money or are they simply bells and whistles? More often than not, they fall into the latter category, so make sure you do your research before you buy! Mattress ads are dominated by offers of interest-free financing…in many cases, for a period of five years or more! In order to offer such long terms, retailers build the added cost of financing into the already inflated price of the product. This means that you will pay more for a financed mattress than you would for a non-financed mattress. At The Original Mattress Factory, we don’t offer long term financing because we believe in transparency and honest pricing. While we do offer both a six month and 12 month financing option, we don’t feel it’s right to go beyond that. We want you to get a great bed that you can actually afford…and you can at The Original Mattress Factory.